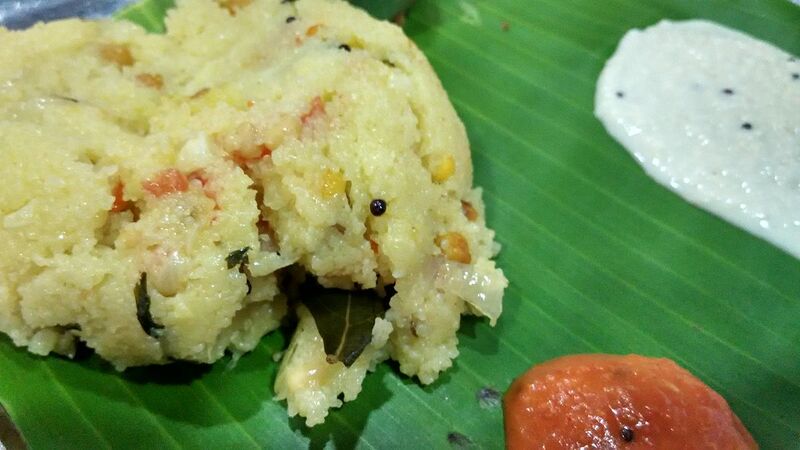 Tomato upma is a tasty version of upma. It is tangy and spicy made of sooji, tomatoes and spices. They are made for breakfast as they are prepared in short time. The tangy tomatoes have lycopene which is good for health and gives clear skin. The peppy tomato keeps us alive all day when eaten for breakfast. It can be prepared with vegetables and little spices to make it nutritious. In another pan, add 6 tbsp of oil or ghee. When the seeds crackle, add curry leaves and cover the lid so that the oil doest splatter. Next add pinch of asafoetida. Put the ginger bits and green chillies. Stir well. Saute till it gives nice aroma. Then add the broken dry red chillies. Onions should be added immediately so that the chillies dont get burnt. Saute for a minute until the onions turn golden brown. Till then keep the tomatoes chopped and pureed. When the onions turn brown, add the tomato puree and let it cook for two minutes. Once the oil starts leaving from sides, simmer it. Add the measured water. The water level should be double the quantity of rava. Add the chopped coriander leaves to the water. Salt can be added to the water and the water should be salty. Keep the lid closed for a minute. Once the water starts boiling, add the roasted rava(half part) to the water. Stir immediately without any stop. Then add the remaining of rava to the water. Stir it quickly to avoid forming any lumps. The rava slowly absorbs the water content and swells up. Add a handful of chopped coriander leaves. Simmer it and close the lid. Let it cook in steam for two to three minutes. After two minutes, switch off the flame. After a minute open the lid and serve with chutney or pickles.? You can add dollop of ghee on each serving to get melting taste.? Tomatoes are one of the widely grown fruits. Whether eaten raw or cooked; there are many highly valued health benefits of tomatoes.